While designing a reader’s website we came across an existing fact that popups usually annoys users, but if we think more purposely then it has the potentials to change its image. Do you ever imagine of creating a lengthy blog post of about 20 pages let as assume if you published it on 20 different pages then your users will feel irritation, so on this circumstances you need to utilize popups and can manage 20 page posts on a single page. Therefore, today we will create a CSS3 Popup Text and Image box for Blogger. 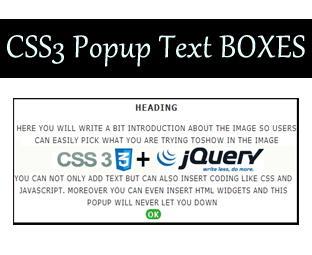 We know you would love to preview these CSS3 Popup image and text boxes ,so don't be shy feel free to give it a try. It has smooth fade-in and fade-out Jquery effect. Bring cherish experience with Blogger, WordPress and those blogging platforms which accepts HTML. Works well with almost every browser i.e. Google Chrome, Internet Explorer, Firefox and etc. The steps of installation are extremely straightforward, and it would not consume more than 10 minutes for complete integration. Now backup your template, so you have a hardcopy of your theme if anything went wrong. Now Search for ]]></b:skin> and then just above it paste the following CSS codes. Now paste the Following Code in your HTML Tab of Blogger Post Editor. 3.Now Replace Show me The Message with the text you want to show to your visitors on popup your button. Important: After pasting the above HTML code don't revert back to Compose tab, just hit the Publish button. You can also place the above code where you want to place your popup button. Here you will write a bit introduction about the image so users can easily pick what you are trying toshow in the image<br /> Here You can Write your multiple texts, you can even use HTML tags and etc. So we hope you will give utilize this popup widget on your blog, if you have any suggestions feel free to send your comments till then peace, blessings and happy learning. http://win7master.blogspot.com/2011/11/popup-text-and-images.html view my post cannot open some menu button other post show menu.. This pop-out button text box is fantastic and I am using it on my blog. Thank you so much! One question. Is there a way I can modify the code so that I could add a video to the box? Would be possible to make the popup automatic, i.e. not triggered by a "click" on the blog page ? When someone visit my blog I would like to display a popup text box after 3 minutes. How to do this ?